Gardening in Washington State » Garden Construction » Organic Soil Amendments in Yards and Gardens: How Much is Enough? 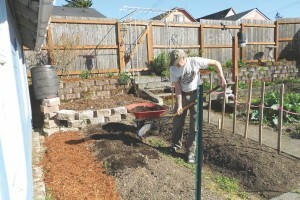 Organic Soil Amendments in Yards and Gardens: How Much is Enough? Gardeners apply organic soil amendments to improve soil and raise healthy plants. While organic soil amend­ments benefit most garden soils, over-application can waste money, increase the risk of harm to water quality, and in some cases, harm plants. Apply about 1/2 inch of organic soil amendment to an established garden bed. Photo by Mary Cogger. For new garden or landscape plantings, add 1 to 3 inches of organic soil amendment to the soil and incorporate to a depth of at least 6 to 8 inches. If your soil lacks organic matter (typically light colored with poor physical proper­ties), add 2 or 3 inches of amendment. If your soil has adequate organic matter, or if salts are a concern, add less (or none at all). If you are establishing landscape plants, amend the entire bed, and not just the planting holes. Permanent landscape beds don’t need organic soil amendments after the ini­tial application. Decomposition of leaf litter and organic surface mulches will help maintain organic matter, creating an environment similar to soil found in forests. Established gardens and landscapes require less organic soil amend­ments—typically about ½ inch per year.